What do a legendary British pop singer and over 26 million proud Lone Star State dwellers have in common? A deep love of a defining moment in Texas History. From the Houston Chronicle (via the AP), check out what happened this week in San– San Antonio! SAN ANTONIO (AP) — Remember the Alamo? Phil Collins sure does. The British 1980s music icon was at the 1836 Battle of the Alamo and Texas Revolutionary shrine in downtown San Antonio on Thursday, announcing the donation of his collection of related artifacts — one so vast it’s considered the world’s largest such private collection. Collins, the 63-year-old Genesis singer-drummer, joked he’d spent “all the money that I made from music” on 200-plus pieces related to the battle where 1,500 Mexican troops laid siege to 200 Texans. He said he wanted to ensure the collection was better cared-for in the future. 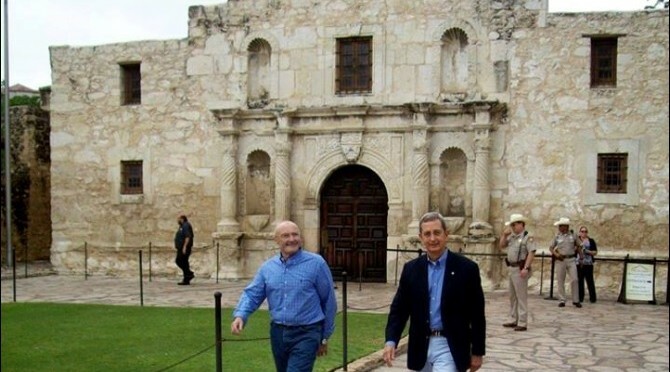 Collins has been an Alamo aficionado since growing up in London and watching actor Fess Parker portray Davy Crockett in a 1950s Disney miniseries. Collins said his favorite artifact was also his first, purchased for him in the 1990s by his then-wife: a receipt for the sale of the saddle of John W. Smith, an Alamo messenger who rode through Mexican lines and pleaded for reinforcements before the battle. The collection also includes a rifle owned by Crockett, his leather shot pouch and a pair of powder horns Crockett is believed to have given to a Mexican officer before his death — as well as muskets and musket balls that belonged to Mexican soldiers. It’s not everyday that that someone so devoted to a cause gives a lifetime’s work of collection and acquisition back to the people. Equally amazing is the reminder at just how profound and special Texas history truly is… this extraordinary state has fans all over the globe, whether they are from here or not. The Alamo site is beloved by most all Texans, and Collins’ extraordinary gift this week should serve as a clarion call for us to once again “Remember the Alamo” and establish a firm plan for its future. Recent debates about how to improve the historical site have become quite heated in its home city. Some want to restore the site to its original 1836 landscape, which is hard to do in the epicenter of the 7th most populous city in the United States. Either way, it’s a debate worth having, and hopefully Texans can come to an agreement soon. As we move farther in time from the fateful, the Alamo’s significance as a world treasure will only continue to grow.